If you’ve been keeping up with my blog, you would know that I LOVE Dawson’s Creek (second only to Daria). I was born in 1990, but I really should have been a teenager in the 90s if you judged by my interests. One weekend while I was visiting my parents, I had Dawson’s Creek on the brain and was cruising on Amazon. This was on my wishlist for a while and I noticed they discontinued the Kindle version, but the paperback edition was quite cheap. I also snagged a trilogy series that puts the Dawson’s Creek characters in a horror story, and I can’t wait to read them! This book was written around the time that the third season was about to air. It contains bios of the main characters (hello, Joshua Jackson! ), the creation of the show and its influence to pop culture, and has a lot of interesting information on creator, Kevin Williamson. I skipped the last couple of parts because it was basically a recap of the first two seasons and I’m in the middle of rewatching the series. It was great to find out that Joshua Jackson is a Nirvana fan. (Me too!) But Mr. Williamson’s story was the most entertaining part for me. I never would have guessed that the teacher from Teaching Mrs. Tingle was actually based on a real life teacher of Williamson’s that constantly belittled his abilities. Teaching Mrs. Tingle is actually one of my favorite films, despite it being a box office bomb. Now days Kevin Williamson is known for working on the Vampire Diaries, but before that and Dawson, he was the creator of the Scream movies. I also learned that he also wrote the script for the Halloween H20. It was really cool finding out all this information about one of my most beloved writers. Minus the Vampire Diaries, ugh. I couldn’t give this book a star rating because it is not listed on Goodreads. But if you are a fan of Dawson’s Creek or Kevin Williamson, I highly recommend it. It’s really cool owning this little piece of the 90s. Okay, let’s do a product review recap. In the last of my little skincare series, I found the AcneFree system and it worked when it came to clearing up my acne. However, I would soon learn that since this kit is chemical based it does heal my acne, but at a price. My face soon became very red and irritated. So, I reluctantly decided to go back to natural skincare, even though I had no luck before. I heard a lot of good hype behind African Black Soap, so I bought a kit I found at Target. 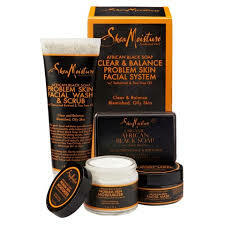 The kit came with the following items: African Black Soap Face and Body Bar, African Black Soap Facial Wash and Scrub, Facial Mask, and Moisturizer. I haven’t used the moisturizer yet, as I have another one to use up. So, I’ll be reviewing the others and will write about the moisturizer at a later date. Note: This kit did not come with a toner or acne spot treatment. Not having an acne treatment is one thing, but toning is very important for your face. So, I went ahead and ordered the African Black Soap Toner on Amazon and will be including it in this review. 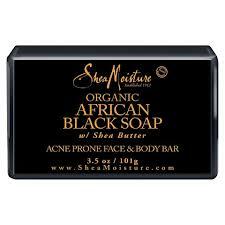 Shea Moisture African Black Soap: The one thing I can say for this bar soap is that I found it did keep the acne at bay. However, I wasn’t very impressed with it overall. There is more to skincare than fighting zits. This soap promises a glowing complexion as well and I didn’t get that. I have a bit of redness in my cheeks that I suspect is from a mild case of rosacea. This soap didn’t help with that and honestly didn’t leave my face feeling very fresh. I’m not a big fan of bar soaps to begin with, but I have since moved on and found a face wash I love. I will probably put this bar in body wash only rotation, as not to waste it. 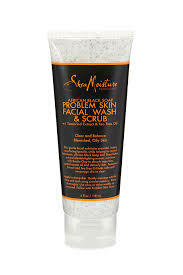 Shea Moisture African Black Soap Facial Wash and Scrub: I absolutely hated this scrub! It smells like sweetened Play-doh to me. Since this is a scrub it comes with beads and I have used skincare products with beads before. None of the other ones actually hurt my skin. This scrub felt very uncomfortable on my skin and even burned my eyes when I didn’t get any of it in them. I’ll probably be throwing this away. Shea Moisture Face Mask: I’ve only used this item once, but I was very impressed with how easy it was to put on and take off. I can’t tell you how many problems I’ve had with face masks just because of the clean up process. I’ll probably use this one up, but I’m not sure if I’ll use it again. 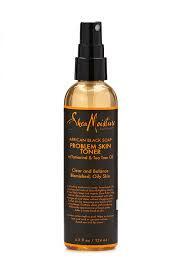 Shea Moisture African Black Soap Toner: I really love this toner! It made my face feel very fresh and picked up anything that was left behind after the washing. 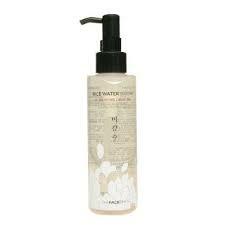 Unfortunately, it probably won’t be a repurchase because of the fact that it is in a spray bottle. It causes me to use up a lot more of it to cover my whole face. 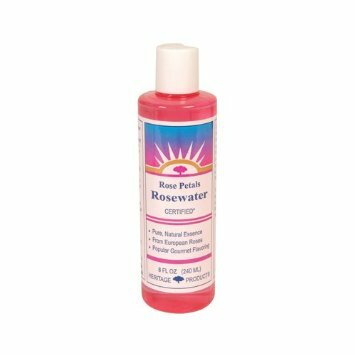 Also, I’m very interested in getting a rosewater toner in order to combat dullness. Overall, I wasn’t very impressed with the Shea Moisture African Black Skincare Kit. But I don’t discourage you from trying it. After all, everyone’s skin is different. 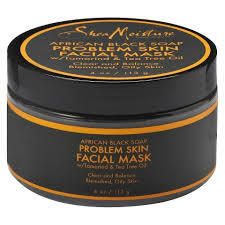 I did mention on the section on the African Black Soap Bar that I finally found my perfect face wash. I purchased it on Etsy and I’ve been telling my fiance that it is “magic in a bottle.” I’ll be posting a review on that next. 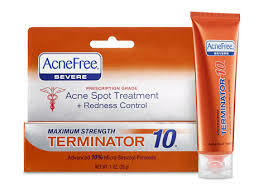 As for acne spot treatments, I’ve discovered that the only thing that really works for my blemishes is BP acne medications. Well, at least I can go natural with everything else. So, I purchased a stand alone AcneFree product that is not sold with a kit. It’s pretty much the same acne fighter in the kit except that it promises to have some natural ingredients that lessen redness. I haven’t used it yet because I’m still getting rid of the lotion from the kit, but we’ll see how it goes. I’m also still searching for my perfect toner and moisturizer. I’ll be purchasing a rosewater toner next and I have two moisturizers to try out: the one from the Shea Moisture kit and one with white tea in it. I read that white tea is good for people that have problems with facial redness. In conclusion, I’ll be reviewing my new permanent face wash next. Now that I have a face wash and know that my acne fears BP, all that’s left to find is a toner and moisturizer. Thank you for joining me in my quest for my natural skincare routine.